I can still remember the day I met Karl-Heinz Otto for the first time. It was a freezing cold afternoon in December. I was working out in our local gym when he walked in. To me, just a novice with only a few weeks of training under my belt, he looked like a giant. Standing 6'2" and 240 lbs heavy, with a beard like a mountain man, his friends called him Grizzly and he was as strong as he looked. My buddy Albert and I were really impressed to see him warming up for the bench press with 225, a weight that Al and I were using for our heavy sets at that time. That day he went up to 500 lbs without a bench shirt, which was an unbelievable feat of strength at that time, especially in our small town gym. But most impressive was his cool-down set with 225, which he fired up to 40 reps. I am sure that some of you think that's not much weight and that there might be lifters who can bench more for even more reps, but I bet that none of them will be able to do it faster than Karl-Heinz. The weight was almost flying up and down when he finished the 40 reps in less than 30 seconds (no, he is not one of those 'short-arm lifters' where the bar travels only three inches from chest to lockout). He improved his performance over the next two years and finally set a Guinness Book World Record in 1988. They even put a photo of him in the book. His record: 225 lbs for 50 reps in 38.7 seconds, and 325 lbs for 10 reps in 7.1 seconds. I'm convinced that I am right to call him the world's fasted bencher. Interestingly enough, the Guinness Book Record still stands (1997). By the way, how do you like his new goal - A one arm dumbbell bench press with 110 lbs for 50 reps in less than 60 seconds. The following interview was done at a local track and field competition in Amsberg, Germany, a few weeks ago. Stephen Korte: Karl-Heinz, can you give us some personal information about yourself like your age, occupation, and anything else you think is worth mentioning. Karl-Heinz: I was born in Amsberg, Germany, on March 17, 1954. I am divorced and currently live with my daughter Janine and my dog Sherry in Bruchhausen, Germany. I work for a U.S. company called Honeywell as an accountant. SK: How did you get started with weight training? KH: I started lifting weights at age 18. At that time I did it to improve my performance in shot-putting. My philosophy was: The stronger I get, the better I will be in the shotput. In retrospect, this wasn't correct because technique is more important for success in track and field than raw strength. But anyway, I was bitten by the iron bug. I worked out 4 hours a day, six days a week. Technique training in the morning and weightlifting later in the afternoon. I did mainly cleans, pulls, squats, bench pressing and some exercises for the abs and lower back. Lifting weights really helped me in the shot. I finally got second at the German Nationals in 1975 and my state record hasn't been broken yet. SK: How did you get involved with powerlifting? KH: During my career as a shot-putter I did a lot of bench pressing and it became my favorite exercise. When I stopped competing and training for the shotput in 1980 I continued lifting weights because I loved it. I specialized on the bench press and competed in some local gym competitions. 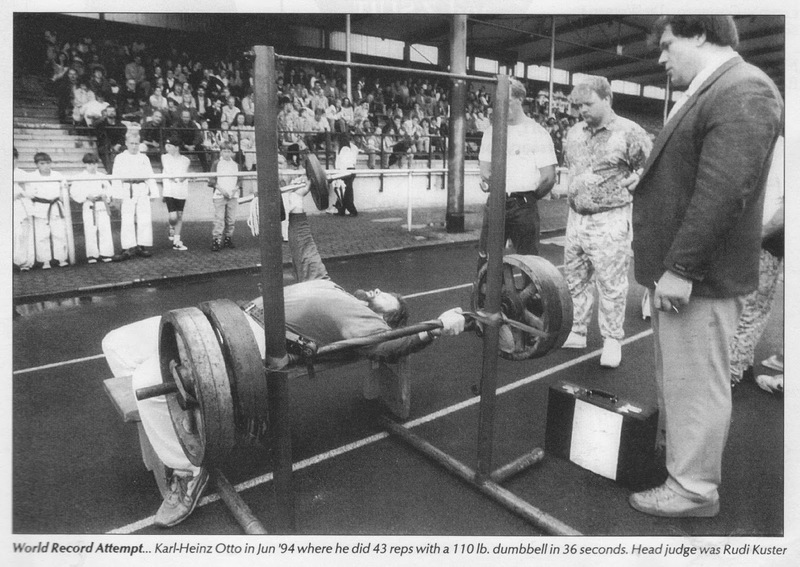 In 1986 I read in a bodybuilding magazine about the German Powerlifting Nationals. I hadn't heard about powerlifting until that day but I thought it would be worth a try. When I looked through the meet results I found that a former shotputter, Klaus Liedtke, had competed. I called him the next day and met him in his gym a week later. This was the first time I ever tried to deadlift and I did 595 lbs for 6 reps. Klaus was impressed and invited me to compete at the state championships four weeks later. That's how I came to powerlifting. SK: How did you perform in powerlifting? Did you perform as well as you did in the shot? KH: No. Unfortunately not. I made a big mistake. I was constantly overtrained. As a shotputter, I was used to workouts every day. I used the same approach with powerlifting. I did every powerlift twice a week and I also did some assistance work. I always lifted to failure. One training session 4 sets of 4 reps, the next session 4 sets of 8 reps. My lower back was killing me, but I didn't stop. In my first competition I deadlifted only 617 lbs. Considering that I had done almost 600 for 6 reps, I obviously made a big mistake. Then I made an even bigger mistake. I used the same routine for the next two training cycles. I trained as hard as possible but I didn't get any stronger. I get even weaker. I had a constant pain in my lower back and developed arthritis in my right knee. The injuries and the fact that I hate the tight powerlifting equipment have led to the decision to quit. SK: You stopped powerlifting, but not bench pressing? KH: That's right. I continued to train heavy on the bench press. Like I said before, it was my favorite exercise and compared to the squat and deadlift it is much easier to train. I had no more pain in my lower back. SK: Tell us about your best lifts in training and competition and the titles you have won so far. KH: My best competition lifts in powerlifting are: squat 551, bench 446, deadlift 665 lbs, all at 220. I don't count the gym lifts. My personal record on the bench is 545, but in a touch-and-go style. In competition I have done 486. Besides several state and regional titles, I consider the second place at the German bench press nationals in 1991 as my greatest success during my powerlifting career. SK: But you haven't only competed in powerlifting and bench press meets? I've heard about some unbelievable feats of strength you performed outside of the sport of powerlifting. Please tell us about that. KH: Sure. In 1988 I set a world record for the Guinness Book. I benched 225 lbs 50 times in only 38.7 seconds. On the same day I benched 325 for 10 reps in 7.1 seconds. Both are world records an the entry was in the Guinness Book for 3 years. No one has ever broken these records. One year later, in 1989, I pulled a bus with 60 people, all in all 30 tons heavy, over a distance of 50 meters. I applied for a Guinness Book entry, but this time they didn't take it. In 1994 I tried to set another world record for the book. A one arm dumbbell press with 110 lbs for 50 reps in less than one minute. This was part of a show program at a strongman competition in Germany. Unfortunately, I lost the groove on the dumbbell press and got only 43 reps, but in 36 seconds. Later in the afternoon, I placed second in the strongman competition. That's it so far. SK: Did you follow a special bench press routine for your world record attempts? I worked out 3 to 4 times times a week. I benched every time, either with a barbell or with dumbbells. I always warmed up properly, followed by four heavy sets. In the first workout I did 4 sets of 4 reps. If I could do 5 reps in my first set I would increase the weight by 10 lbs for the next set. One rep was always 10 lbs. If I did only 3 reps on the first set, I decreased the weight by 10 lbs. In my next workout I followed the same approach, but this time with 4 sets of 8 reps. Every training session was finished by a cooldown set with 225 lbs for as many reps as possible. I also did a maximum attempt every two weeks. Some bench press sessions were followed by dumbbell incline presses or press behind the neck. I used the same approach for the assistance work, either 4 sets of 4 reps, or 4 sets of 8 reps. Barbell curls and seated rows were done once a week, each exercise with 3 sets of 12-15 reps.
SK: What are your future goals in powerlifting? Do you plan any world record attempts? KH: Oh yes, I still want that world record in the one arm dumbbell press - 50 reps with 110 lbs in less than one minute. I've just started a heavy training cycle and I can already do 38 reps. It's just a question of time when it will happen. Right now, I am looking for a competition where I can do that exhibition, hopefully by the end of this year. SK: Are there any final comments that you would like to make? Hey, is there anybody out there who can break my records? I need something to keep me motivated!